The Sierra Madre Occidental (SMO) of western Mexico (Fig. 1) is the least deformed silicic large igneous province on Earth, as well as the largest Cenozoic one (Bryan, 2007; Ferrari et al., 2007; Bryan and Ernst, 2008). The SMO volcanic rocks also host one of the largest epithermal precious-metal deposits in the world (Dreier, 1984; Staude and Barton, 2001). The SMO physiographic province consists of a high, relatively unfaulted volcanic plateau, about 1,200 km long and 300 km wide, averaging 2,000 m above sea level. The term SMO is also used to describe the broader Tertiary volcanic province that consists of the largest known ignimbrite field on earth (Fig. 1). Less than 10% of this vast and extremely well-exposed, economically important terrane has been mapped. Figure 1: Tertiary volcanic rocks of the Sierra Madre Occidental (SMO) and adjacent regions (yellow), north of the Trans-Mexican Volcanic Belt (orange). The SMO forms a high plateau, dominated by largely unextended/weakly extended Oligocene ignimbrites of the silicic large igneous province, referred to widely as Upper Volcanic Complex (UVC). These rocks are underlain by very poorly understood andesitic arc rocks, referred to widely as Lower Volcanic Complex (LVC). 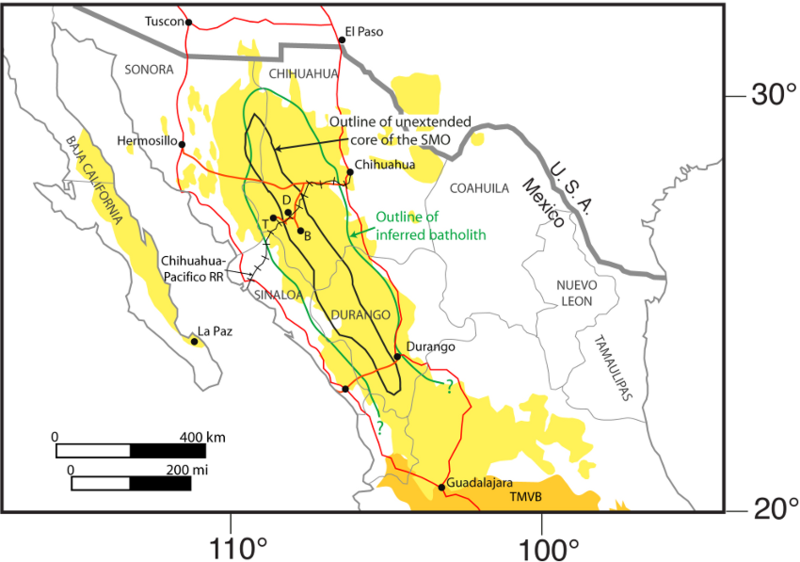 Map shows the two roads that cross the range and the Chihuahua-Pacifico train tracks. D = Divisadero, B = Bahuichivo, T = Temoris. Large igneous provinces have been the subject of research since the earliest days of geology, and many publications have examined their origin, but much fewer have examined their volcanic stratigraphy, and even fewer have focused on silicic LIPs (White and Skilling, 2008). As a newcomer to research in this part of Mexico, I present a discussion of the volcanology, stratigraphy and structure of the SMO silicic LIP, mainly by pointing out unresolved problems. Discussion of the petrogenesis of the SMO is deferred to a future LIP of the month posting by other, better-qualified authors. There are more questions than interpretations posed in my review. Access has long been a major problem in the SMO, as summarized by McDowell (2007), mainly because it is dissected by five spectacular canyons that drain toward the Gulf of California, each comparable in size to the Grand Canyon. A traverse along the Mazatlan – Durango road was carried out in the 1970’s to early 1990’s, and construction of the Hermosillo-Chihuahua road has facilitated work there since the mid-1970’s (Fig. 1; see discussion and references in McDowell, 2007). Recent mapping in the southern part of the range has been by satellite and air photo, then accessed by dirt/gravel road and helicopter along two transects (Ferrari et al., 2002, 2007). Access is now improving rapidly, due to construction of roads to serve a renewed gold rush, as well as tourism, so the future looks bright for field research in the SMO. Three-fourths of the volume of the Late Eocene – early Miocene ignimbrite flareup of North America was erupted from the SMO, and two-thirds of this occurred in a first pulse at about 38 – 28 Ma (McDowell and Clabaugh, 1979; Henry and Fredrikson, 1987; Wark et al., 1990; Aguirre-Diaz and McDowell, 1991; McDowell and Mauger, 1994; Aranda-Gomez et al., 1997; McDowell et al., 1997; Gans, 1997; Nieto-Samaniego et al., 1999; Ferrari et al., 1999, 2002; Aguirre-Diaz and Labarthe-Hernandez, 2003; Ferrari et al., 2007; McDowell, 2007; Aguirre-Diaz et al., 2008). This first pulse may have triggered Early Oligocene global cooling (Cather et al., 2003). A second pulse appears to be largely restricted to the southern SMO, and is middle Miocene in age. The first and second pulses were speculatively attributed to two consecutive detachments of the subducted Farallon plate (Ferrari et al., 2002). The SMO ignimbrite flare-up is alternatively considered to be the product of subduction zone processes (Sigurdsson et al., 2000; Ferrari et al., 2002, 2007), or of intraplate volcanism that preceded continental breakup (Bryan and Ernst, 2008). Regardless, all workers agree that ignimbrite pulses in the SMO represent the precursors of lithospheric rupture that eventually led to the formation of the Gulf of California (Ferrari et al., 2007). This resulted in production of a major batholith under the ignimbrite field (Fig. 1), as inferred from magnetic data (Purucker et al., 2007) and gravity data (Aiken et al., 1988). Previous episodes of subduction may be required to trigger the widespread crustal melting that generates a silicic LIP (Bryan, 2007; de Silva and Gosnold, 2007; de Silva, 2008). In the SMO, Cretaceous to Late Eocene age calc-alkaline igneous and volcaniclastic rocks of dominantly intermediate composition form the underpinnings of the silicic LIP (Aguirre-Diaz and McDowell, 1991). These are referred as the Lower Volcanic Complex (LVC), while the silicic LIP is referred to as the Upper Volcanic Supergroup or Upper Volcanic Complex (UVC) (McDowell and Keizer, 1977; Ferrari et al., 2007). Using available data from Mexico, and by analogy with better-studied rocks north of the U.S.-Mexico border, two different arcs may be included in the LVC: a Cretaceous-Paleocene arc that migrated eastward with time under a compressional regime (Coney and Reynolds, 1977; Damon et al., 1981), and an Eocene arc that formed during westward-migrating magmatism attributed to slab steepening (e.g. see references in Dickinson, 2007), perhaps at least in part in an extensional tectonic regime (our unpublished mapping). Eocene magmatism may constitute a distinct episode in the magmatic evolution of western Mexico (Henry and Fredrikson, 1987; Aguirre-Diaz and McDowell, 1991; Ferrari et al., 2007), representing a possible precursor to the Oligocene ignimbrite event (Wark, 1991; Ferrari et al., 2007). A great deal more is known about the age and nature of precursory (mainly andesite) volcanism in the Southern Rocky Mountain ignimbrite field (Lipman, 2007) than it is in the SMO. The Eocene arc in the SMO is important because it may be genetically linked to the silicic LIP, in terms of structural and mineralization styles. We are currently studying the transition from the LVC “normal” andesite arc to the UVC ignimbrite flareup in the Temoris region (Fig. 1), where post-ignimbrite extension has brought these rocks to the surface over an approximately 400 km2 area. In their summary of the characteristics of Late Paleozoic to Cenozoic LIPs of both mafic and silicic composition, Bryan and Ernst (2008) infer that all 16 examples of large igneous provinces on continents were emplaced into or across pre-existing sedimentary and rift basins, with one exception: the Sierra Madre Occidental. The massive ignimbrite volcanism of the UVC has been widely interpreted to record the onset of extension (Wark et al., 1990; Gans, 1997; Luhr et al., 2001; Ferrari et al., 2002; Ferrari et al., 2007). However, in the Temois to Divisadero region (Fig. 1), my Ph.D. student Bryan Murray and I have mapped synvolcanic normal faults in a widespread, thick succession of andesitic arc volcanic and volcaniclastic rocks (LVC) that are buried beneath thick ignimbrites (UVC). The andesitic rocks show onlap of half graben shoulders, and dips fan due to rotation about normal faults that either do not cut the overlying ignimbrite succession, or offset it much less. Although these andesites are not yet dated, we believe they pre-date the first ignimbrite flare-up, because volcaniclastic deposits within them (fault talus breccias, debris flow deposits, pebbly sandstones, and nonwelded ignimbrites) lack welded ignimbrite clasts entirely. We are testing the hypothesis that an Eocene extensional arc formed a precursor to the silicic LIP in this region, but age controls are needed. The SMO represents one of the largest epithermal precious metal deposits in the world. Direct age controls on this world-class metallogenic province are lacking, with only one date on veins associated with ores (Henry, 1975). Camprubi et al. (2003) made the simplifying assumption that the age of the volcanic host is close to the age of the epithermal mineral deposit, to tentatively define three epithermal pulses: a Middle Eocene pulse in LVC rocks, and Late Eocene to Oligocene and Early Miocene pulses that correspond to the two ignimbrite flare-ups (UVC). The earliest event is the least well understood, in terms of its structural setting, but the younger two are clearly controlled by normal faults and transfer zones. The SMO is interpreted to contain as many as 350 large calderas, using estimates of the total volume of ignimbrite, but less than 15 have been found (Swanson and McDowell, 1984; Swanson et al., 2006). Although this is at least in part a problem of incomplete map coverage, perhaps circular or spheroidal calderas are not as common in the SMO as they are in other areas, such as the southern Rocky Mountain volcanic field described by Lipman (2007). Recent work in the southern SMO suggests that “graben calderas”, rather than circular calderas, dominate there, and that these are fed by ignimbrite fissures (Aguirre-Diaz and Labarthe-Hernandez, 2003; Aguirre-Diaz et al., 2008). This is consistent with descriptions of the Altiplano-Puna Volcanic Complex, where bigger eruptive centers are complex, large-scale structures influenced by tectonic grain, referred to as volcano-tectonic depressions by de Silva and Gosnold (2007). There is much yet to be learned about the physical volcanology of the SMO. Aguirre-Diaz et al. (2008) note a lack of Plinian fall deposits and instead note that “pyroclastic surge-like, cross-bedded deposits are relatively common” in the southern SMO. Plinian fall deposits are also not much described in publications on the northern SMO (e.g. Swanson et al., 2006), and we have puzzled over their apparent scarcity in the areas we have examined, although large tracts of ground remain unexamined. However, along the road to Batopilas (Fig. 1) there is a pyroclastic surge deposit that is very distinctive because it has a single dune bedform with a set height of about 5 – 7m. North of Temoris, we have mapped a series of surge-like ignimbrites with thick layers of co-ignimbrite lag breccia, interstratified with thick silicic lava flows. These flank a major fault zone intruded by aligned silicic plugs, suggesting a fissure-style eruption for the UVC there. Epithermal deposits are hosted in the LVC along this fault-fissure zone and appear to be related to the silicic intrusions. A similar association between silicic intrusions and mineralization in the SMO is discussed by Bryan et al. (2008). Silicic LIPs are recognized as the largest accumulations of primary volcaniclastic rocks on Earth (Bryan, 2007); however, far less is known about the volume and nature of associated subvolcanic rocks. These are brought to the surface on the western, extended flank of the northern SMO, where our reconnaissance work suggests that silicic hypabyssal intrusions intrude the LVC for a distance of at least 70 km westward (trenchward/riftward) of the unextended ignimbrite core of the range. These undated and largely unmapped silicic intrusions consist of fissures several km long and 100’s of meters wide, as well as lines of plugs, that appear to follow NNW-SSE normal faults or ENE-WSW transfer zones. These intrusions make up some of the dramatic cliffs that are the main tourist attraction of the Copper Canyon train, with the biggest cliff at Temoris (Fig. 1), where the train makes a famous, huge loop inside a tunnel to ascend the canyon. Some of the silicic intrusions we have examined pass upward into lava flows and domes, interstratified with proximal ignimbrite facies. Our map data is still insufficient to determine if any of these fissures feed large-volume lava flows, like the flows with supervolcano magmatic volumes mapped in the 1.6 Ma Gawler Range Volcanics of south Australia (Allen et al., 2008). Although Pliocene ignimbrite fields are less altered and deformed than older fields, they do not provide a time-integrated and deeper structural view the way that the Eocene to Miocene SMO silicic LIP does. Future work in the SMO is expected to focus on the structural controls of vents and intrusions in the silicic LIP, and the relationships of these to structural and volcanic features in the underlying andesite arc rocks. Geochronologic work will be essential for this. The geochronological efforts of McDowell (2007) over the past 35 years are truly impressive, but many more dates are needed across this enormous terrane in order to date fault zones, identify periods of peak eruptive intensity and calculate their volumes, and determine the timing of hydrothermal events that formed prospective mineral deposits. There remain at least as many questions as there are answers regarding the geology of the largest Cenozoic silicic LIP on Earth. We owe much to the pioneering and sustained efforts of Fred McDowell and his group, who worked under conditions of very difficult access. Thanks to tourism and mining, access has improved greatly over the past few decades, so we are optimistic that this province will finally get the attention it deserves. I am extremely grateful to Paramount Gold and Silver for the financial and logistical support they have provided in the SMO, for access to their proprietary data, and for valuable discussions with Danny Sims, Larry Segerstrom, Denis Norton, Hector Arruti Olivares, and Javier Oziel Martinez. I also acknowledge the excellent mapping efforts of my Ph.D. student Bryan Murray. I wish to thank the following people for discussions about the SMO (while not holding them responsible for any errors on my part): Elena Centeno Garcia, Fred McDowell, Eric Swanson, Luca Ferrari, Scott Bryan, Gerardo Aguirre-Diaz, Michael Purucker, and Paul Renne. Aguirre-Diaz, G.J., and McDowell, F.W., 1991, The volcanic section at Nazas, Durango, Mexico, and the possibility of widespread Eocene volcanism within the Sierra Madre Occidental: Journal of Geophysical Research, v. 96, p. 13373-13388. Aguirre-Diaz, G.J. and Labarthe-Hernandez, G., 2003, Fissure ignimbrites: Fissure-source origin for voluminous ignimbrites of the Sierra Madre Occidental and its relationship with Basin and Range faulting: Geology, v. 31, p. 773-776. Aguirre-Diaz, G.J., Labarthe-Hernandez, G., Tristan-Gonzalez, M., Nieto-Obregon, J. and Gutierrez-Palomares, I., 2008, The ignimbrite flare-up and graben calderas of the Sierra Madre Occidental, Mexico, in, Gottsman, J., and Marti, J., Caldera Volcanism: Analysis, Modeling and Response: Developments in Volcanology, v. 10, Elsevier, Amsterdam, p. 143-174. Aiken, C.L.V., Schellhorn, R.W. and de la Fuente, M.F., Gravity of northern Mexico, in, Clark, K.F., Goodell, P.C. and Hoffer, J.M., eds., Stratigraphy, tectonics and mineral resources of northern Sierra Madre Occidental, Mexico: El Paso Geological Society Guidebook, p. 119-133. Allen, S.R., McPhie, J., Ferris, G. and Simpson, C., 2008, Evolution and architecture of a large felsic igneous province in western Laurentia: The 1.6 Ga Gawler Range volcanics, south Australia: Jounal of Volcanology and Geothermal Research, v. 172, p. 132-147. Aranda-Gomez, J.J., Henry, C.D., Luhr, J.F. and McDowell, F.W., 1997, Cenozc volcanism and tectonics in NW Mexico – a transect across the Sierra Madre Occidental volcanic field and observations on extension-related magmatism in the southern Basin and Range and Gulf of California tectonic provinces, in, G.J. Aguirre-Diaz, J.J. Aranda-Gomez, G. Carrasco-Nunez, and L. Ferrari, eds., Magmatism and Tectonics of Central and Northwestern Mexico – A Selection of the 1997 IAVCEI General Assembly Excursions: Mexico, Universidad Autonoma de Mexico, Instituto de Geologia, Excursion 11, p. 41-84. Bryan, S., 2007, Silicic large igneous provinces: Episodes, v. 30, no. 1, p. 1 – 12. Bryan, S., and Ernst, R.E., 2008, Revised definition of Large Igneous Provinces (LIP): Earth-Science Reviews, v. 86, p. 175-202. Bryan, S.E., Ferrari, L., Reoners, P.W., Allen, C.M., Petrone, C.M., Ramos-Rosique, A., and Campbell, I.H., 2008, New insights into crustal contributions to large-volume rhyolite generation in the mid-Tertiary Sierra Madre Occidental province, Mexico, revealed by U-Pb geochronology: Journal of Petrology, v. 49, no. 1, p. 47-77. Camprubi, A., Ferrari. L., Cosca, M., Cardellach, E., and Canals, A., 2003, Ages of epithermal deposits in Mexico: Significance and links with the evolution of Tertiary volcanism: Economic Geology, v. 98, p. 1029-1037. Cather, S.M., Dunbar, N.W., McDowell, F.W., McIntosh, W.C., and Scholle, P.A., 2003, Early Oligocene global cooling, volcanic iron fertilization, and the ignimbrite flare-up of southwestern North America: Geological Society of America Abstracts with Programs, v.35, no. 6, p. 255. Damon, P.E., Shafqullah, M., and Clark, K.F., 1981, Age trends of igneous activity in relation to metallogeneisis in the southern Cordillera, in, Dickinson, W.R., and Payne, W.D., eds., Relations of tectonics to ore deposits in the southern Cordillera: Arizona Geological Society Digest, v. 14, p. 137-154.
de Silva, S.L., and Gosnold, W.A., 2007, Episodic construction of batholiths: Insights from the spatiotemporal development of an ignimbrite flareup: Journal of Volcanology and Geothermal Research, v. 167, p. 320-355, doi:10.1016/j.volgeores.2007.07.015. de Silva, S.L., 2008, Arc magmatism, calderas, and supervolcanoes: Geology Research Focus, Geology, v. 36, no. 8, p. 671-672. Dickinson, W.R., 2007, Geotectonic evolution of the Great Basin: Geosphere, v. 2, p. 353-368; doi: 10.1130/GES00054.1. Dreier, J., 1984, Regional tectonic control of epithermal veins in the western United States and Mexico, in, Wilkins, J., ed., Gold and Silver Deposits of the Basin and Range Province Western U.S.A.: Arizona Geological Society Digest, v. 15, p. 28 – 50. Ferrari, L., Lopez-Martinez, M., Aguirre-Diaz, G., and Carrasco-Nunez, G., 1999, Space-time patterns of Cenozoic arc volcanism in central Mexico: From the Sierra Madre Occidental to the Mexican Volcanic Belt: Geology, v. 27, no. 4, p.303-306. Ferrari, L., Lopez-Martinez, M., and Rosas-Elguera, J., 2002, Ignimbrite flare-up and deformation in the southern Sierra Madre Occidental, western Mexico: Implications from the late subduction history of the Farallon plate: Tectonics, v. 21, no. 4, p. 1-24. Ferrari, L., Valencia-Moreno, M., and Bryan, S., 2007, Magmatism and tectonics of the Sierra Madre Occidental and its relation with the evolution of the western margin of North America, in, Alaniz-Alvarez, S.A., and Nieto-Sarmaniego, A.F., eds., Geology of Mexico: Celebrating the Centenary of the Geological Society of Mexico: Geological Society of America Special Paper 422, p. 1-39. Gans, P.B., 1997, Large-magnitude Oligo-Miocene extension in southern Sonora – implications for the tectonic evolution of northwest Mexico: Tectonics, v. 16, p. 388-: Geological Society of America Special Paper 408. Henry, C.D., 1975, Geology and geochronology of the granitic batholithic complex, Sinaloa, Mexico: Unpublished PhD Dissert., Univ. Texas, Austin, 158 pp. Henry, C.D., and Fredrikson, G., 1987, Geology of southern Sinaloa adjacent to the Gulf of California: Geological Society of America, Map and Chart Series, Map MCH063, 14 pp. Lipman, P.W., 2007, Incremental assembly and prolonged consolidation of Cordilleran magma chambers: Evidence from the Southern Rocky Mountain volcanic field: Geosphere, v. 3, p. 42 – 70, v. 3, p. 423-70, doi: 10.1130/GES00061.1. Luhr, J., Henry, C.D., Housh, T.B., Aranda-Gomez, J., and McIntoch, W.C., 2001, Early extension and associated mafic volcanism from the southern Basin and Range province: Geology and petrology of the Rodeo and Nazas volcanic field, Durango, Mexico: Geological Society of America Bulletin, v. 113, p. 760-773. McDowell, F.W. and Keizer, R.P., 1977, Timing of mid-Tertiary volcanism in the Sierra Madre Occidental between Durango City and Mazatlan: Geological Society of America Bulletin, v. 88, p. 1479-1487. McDowell, F.W. and Clabaugh, S.E., 1979, Ignimbrites of the Sierra Madre Occidental and their relation to the tectonic history of western Mexico: in, C.E. Chapin and W.E. Elston, (eds. ), Ash-Flow Tuffs: Geological Society of America Special Paper 180, p. 113-124. McDowell, F.W. and Mauger, R.L., 1994, K-Ar and U-Pb zircon geochronology of Late Cretaceous and Tertiary magmatism in central Chihuahua state, Mexico: Geological Society of America Bulletin, v. 106, p.118-132. McDowell, F.W., Roldan-Quintana, J., and Amaya-Martinez, R., 1997, Interrelationship of sedimentary and volcanic deposits associated with Tertiary extension in Sonora, Mexico: Geological Society of America Bulletin, v. 109, p. 1349-1360. McDowell, F.W., 2007, Geologic transect across the northern Sierra Madre Occidental volcanic field, Chihuahhua and Sonora, Mexico: Geological Society of America Digital Map and Chart Series 6, 70 pp. Nieto-Samaniego, A. Ferrari, L., Alaniz-Alvarez, S., Labaarthe-Hernandez, G. and Rosas-Elguera, J., 1999, Variation of Cenozoic extension and volcanism across the southern Sierra Madre Occidental volcanic province, Mexico: Geological Society of America Bulletin, v. 111, no. 3, p. 347-363. Sigurdsson, H., Kelley, S., Leckie, R.M., Carey, S., Bralower, T., and King, J., 2000, History of circum-Caribbean explosive volcanism: Ar/Ar dating of tephra layers: in, R.M. Leckie, H. Sigurdsson, G.D. Acton and G. Draper, eds., Proceedings of the Ocean Drilling Program, Scientific Results, v. 165, p. 299-314. Staude, J.-M. and Barton, M.D., 2001, Jurassic to Holocene tectonics, magmatism and metallogeny of northwestern Mexico: Geological Society of America Bulletin v. 113, p. 1357-1374. Swanson, E.R. and McDowell, F.W., 1984, Calderas of the Sierra Madre Occidental volcanic field, western Mexico: Journal of Geohysical Research, v. 89, p.8787-8799. Swanson E.R., Kempter. K.A., McDowell, F.W., and McIntosh, W.C., 2006, Major ignimbrites and volcanic centers of the Copper Canyon area: A view into the core of Mexico’s Sierra Madre Occidental: Geosphere,v. 2, no. 3, p. 125-141. Wark, D.A., 1991, Oligocene ash-flow volcanism, northern Sierra Madre Occidental: Role of mafic and intermediate-composition magmas in rhyolite genesis: Journal of Geophysical Research, v. 96, no. B8, p. 13,389-13,411. Wark, D.A., Kempter, K.A., and McDowell, F.W., 1990, Evolution of waning, subduction-related volcanism, northern Sierra Made Occidental, Mexico: Geological Society of America Bulletin, v. 102, p. 1555-1564. White, J.D.L., and Skilling, B.F., 2008, Preface: Physical volcanology of large igneous provinces: Journal of Volcanology and Geothermal Research, v. 172, p. 1-2.